Read more about Robert Chapman’s extensive background and why he received a Five Star quality rating from the Paladin Registry. Paladin Registry is an independent company that researches financial advisors for investors and documents their credentials, ethics, business practices and services. Paladin conducts due diligence that is based on data in the public domain and uses a proprietary algorithm to measure the quality of financial advisors. Paladin cannot independently verify all of the information that is provided by advisors. It is the responsibility of investors to ask for additional documentation when necessary or appropriate. Robert Chapman voluntarily participates in Paladin’s Financial Advisor Due Diligence (FADD) program. FADD is Paladin’s highest level of due diligence that is based on background checks for credentials and ethics. Robert has participated in Paladin’s FADD program for six consecutive years. Click here to view Robert’s FADD findings report that documents the results of Paladin’s background checks. Using this link takes you to a site outside the Compass Wealth, LLC. website. Neither Cetera Financial Specialists LLC, Compass Wealth nor any of their affiliates are responsible for the content of such site. 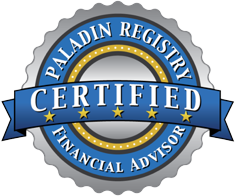 Financial advisors pay a fixed monthly fee to be profiled in the Paladin Registry. Paladin’s research and rating have no bearing on the future advice, services, or results of an advisor or firm. Inclusion in the Registry does not constitute an endorsement, recommendation, testimonial, or favoring by Paladin, nor does it constitute a claim, whether explicit or implicit, by Paladin that an advisor or firm’s qualifications, products, services, opinions, advice or claims are superior, reputable, honest, ethical, competent, or will result in exceptional financial returns. Investors are advised to check the advisor’s compliance record at FINRA/BrokerCheck before selecting a financial advisor.